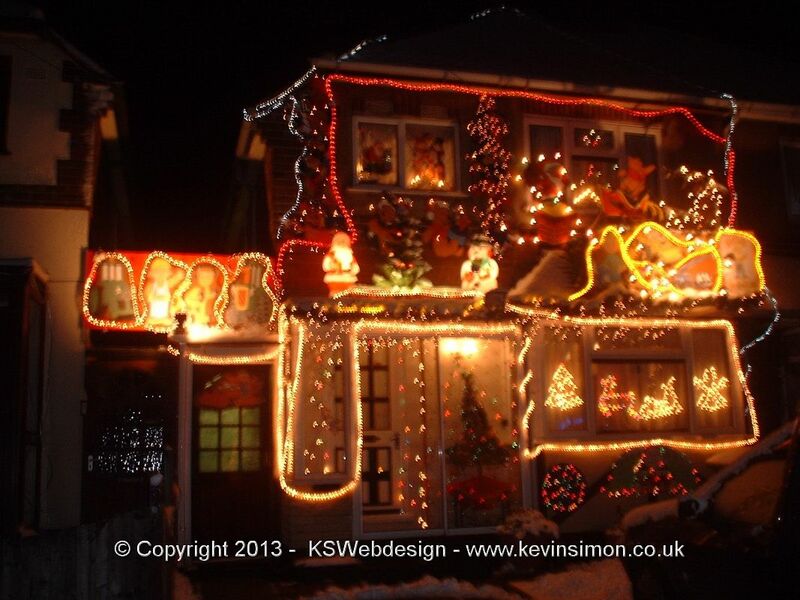 First thing I have got to say that I’m one of these people that do the house up with Christmas lights, their are some people that think this is tacky and cheap and others that love seeing houses done up, some people do up their house supporting charities etc, but I do it just for fun. I am in the process of putting up the lights for this year and this year will be raising money for ST Giles hospice, a charity very close to my heart. See HERE for more details. Doing my house with lights started from my father doing the house with lights, my parents live half way down Friezland Lane, Brownhills, now anyone local to Brownhills will know of his displays from a few years ago, unfortunately because of health problems he doesn’t do it anymore, my parents house used to be the most lite up house in Brownhills and each year he used to have more and more. I will talk about my father’s displays later in this article. 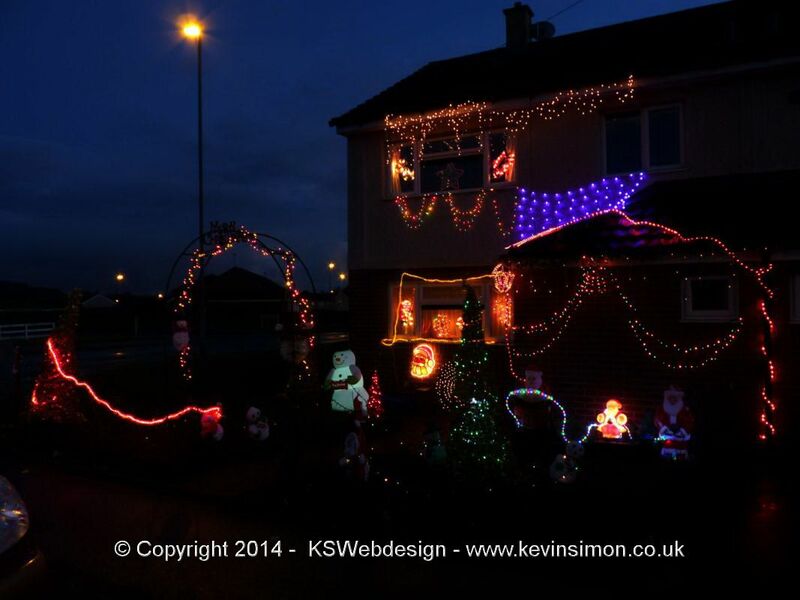 So once I first brought my first house I started to do displays, I lived in Lindon close, Brownhills just behind the flats. 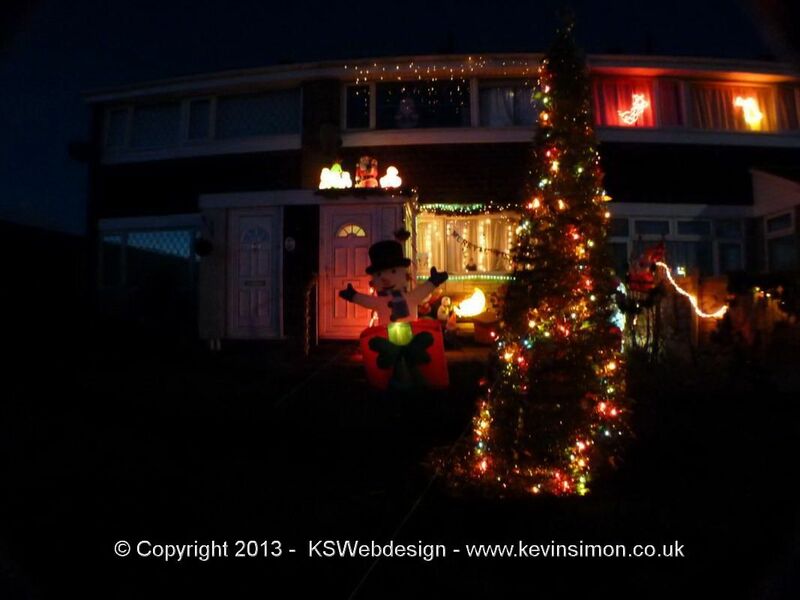 Now the first year it wasn’t that much, just a few lights in the conifer tress at the front and because we had a canopy at the front of the house I built a small shelf and put some of the small inflatable snowmen and santa’s on and a few 2ft Xmas trees with some twinkly lights on, which looked ok, but then in the sales after Christmas got more for the next year, each year to display grew and grew, with the the plastic figures that are about 3ft high with light bulbs in, then more rope lights and one year I even used a old ladder from a cabin bed with a rope light around the frame, with a santa suit on so looked like santa was climbing the ladder. I also got some gold 6ft tinsel Christmas trees that had a pole in the middle that be put on the shelf I had made as these would sway in the wind, with rope lights inside and then normal twinkly lights around the tree itself. The final year I was in that house was the most I had ever done, again used a shelf on the canopy and then ropes lights and normal lights on the slope of the canopy, lights in each of the bed room windows and then a net light over the front bay window. The shelf had a large display of all different figures, tress, lights etc on and n the garden as we had large confier trees these had lights in, in the centre of he garden was a large light up blowup snowman, I then used loads of the small inflatable figures in the garden, as we had a wall at the front, I decorated this with boards with pictures using the stiff plastic present bags, it then rope lights around. I was nice to see he kids faces when they seen it, and even better one night when we want getting back from shopping a woman with her daughter taking photos of the decorations. At the end these display used to take me around 4 days to put up that included all the assembling aswell as all the electrical wiring which was a lot used to use on average 4 junction boxes for the normal mains decorations and at least 15 sockets for the power block lights. Though could normally get it down within a day and about 2 to pack it all away. Then I had to move into a flat for a few years so then couldn’t do any outside displays only a few things in the windows, though did make up for it inside. Then I met my partner, so stared again to do basic displays, though this is when I found that a lot of the lights I got had either been broke, this was mainly rope lights with sections out, or I had got twinkly lights that lots of bulbs had broke or no power blocks, I had a lost at least four or five sets of 150 – 300 twinkly lights, I had given to a friend 2 large rope lights for use in the summer in her garden. So my stock had dwindled. Though we did make a good display in her long front garden with rope lights down to fence, she normal just put up 2 sets of twinkly icicle lights from the guttering, so these went up. She also had a flat porch so put a few of the largest plastic light up figures on there. so She also had two blow up presents the move though the second year of doing that the one of them packed up, and also plastic figures on the roof because of the strong winds keep blowing over and broke the light fitting in two of them. So these had to be disconnected, also one of the large rope lights developed a fault the was generating to much heat so this had to be disconnected also. Though the kids around the area did like the displays wasn’t as much as I used to do, on the final year in the house I had from my father some boards he made made and hand painted years ago of scenes using Disney characters, these were mounted in the fence and lists around them, and in the garden used some of the inflatables and some small Xmas trees. 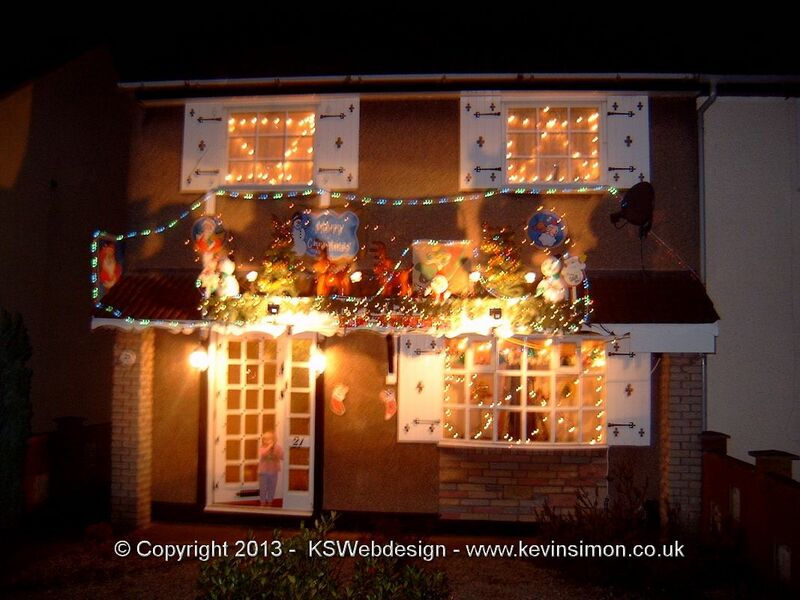 In these years my father really improved his displays having loads of lights including rope lights around the house and over the roof and all down the drive and using all the different type of boards he had designed than he had light up, each year he normally did a different theme. He also used to use the space on top of the gap between theirs and the neighbours with large blow up sante. These displays were great unfortunately because of his health he started to do less and less, though I used to help as much as possible, he still does sample displays in the Windows and the porch, the still look great and festive. Now upto present day, we all moved into a new house in Brownhills West, this is a corner house so I have also the back fence to build a shelf inside the garden to make a display on, also the front garden though we do have a porch it has a sloped roof so hard to do display on using the 3d decorations. As this is the first year in the property I have just done what I can with what I have got from my old stock and to see how it works. At the front we have a bench, So the missus wanted a full size santa clause so we got a men’s santa suit and filled with sealed bags of newspaper, to give the shape of a body and used one of the 2ft inflatables inside for the head and old Santa’s sacks to represent presents, next to this is a ladder with rope light around and a plastic light up santa on a half moon. We have the icicle lights on the top of the gutting as well as the blow up 5ft light up snowman next to he door with several rope lights. The 6ft gold Xmas tress I have with the poles 2 of them are out the front with rope lights and twinkle lights on, on top of the porch are just some normal twinkle led lights. On the fence with the shelf built inside the garden, I have several of the 4ft plastic figures some with light bulbs in others as don’t have the light fittings so I have fed through rope lights. There again is also a 6ft gold tinsel Xmas tress, on the side of the fence I have used the Disney boards that my dad has gave us last year with rope lights around. Unfortunately 2 sets of the lights were not working and also had to throw away 2 rope lights. But the main problem was the partners blow up presents that moved as one stopped working and this year both the fans had stopped working I had tried to get the fans working but couldn’t, so in the new year will order two new fans for the display next year. Next year the display will be even better as throughout 2014, I will be starting to repair some of the rope lights and other light as well as the blow up items. And come the day after boxng day will be spending a good few hundred on new lights and 3D items. So come next year will be even more, as they are two house on the next Street do loads more than what I have done, but they will have to watch out as mine will be brighter next year even though I’m kind of the new kids on the block for the Christmas lights around here. Though the one guy puts scaffolding up in front of the house as we have restrictions on what we can put in the framework of the house, though his looks get a night when all lite up in the day don’t seem to look that good, I like my displays to look good both night and day which is why we make santa sitting on the back home and using the tinsel Xmas trees etc etc. So next year 2014 my display will be bigger and brighter than this year as I know now some tricks to get the display and decorations looking great and also I have got to carry on the tradition from my father of having a really nice display and one of the best in the area, just to make my father proud.